Amazon’s deals for Cyber Monday will include at least some Xbox One and Playstation 4 items in addition to dozens of current-generation (Xbox 360 and PS3) games, accessories and console offerings. Make sure you check out Amazon’s Cyber Monday video game deal hub here and take a look at what’s currently on offer. Note that the page is expected to be updated as information on more details is released. Currently you can also take a look at what deals are currently known and when you can expect them to go live. The only next-gen (Xbox One and PS4) deals currently available all relate to Skylanders, but hopefully that will be expanded upon shortly. 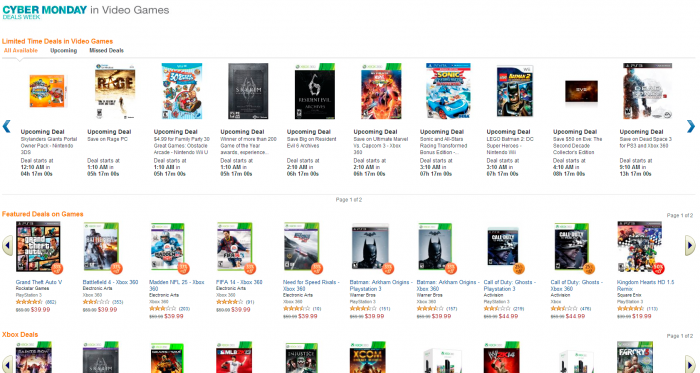 Otherwise if you still game on your current gen system or PC, there is dozens of good games going cheap.